While Haute Couture Week in Paris may have offered a much-needed break from the European menswear escapades, the fall-winter season of men’s shows had to eventually come to an end—and what better place to do it than in New York City? This season was certainly not without its debut buzz, as Raf Simons and Represent both revealed their first collections to be shown stateside—each instant hits and easy additions to this list. 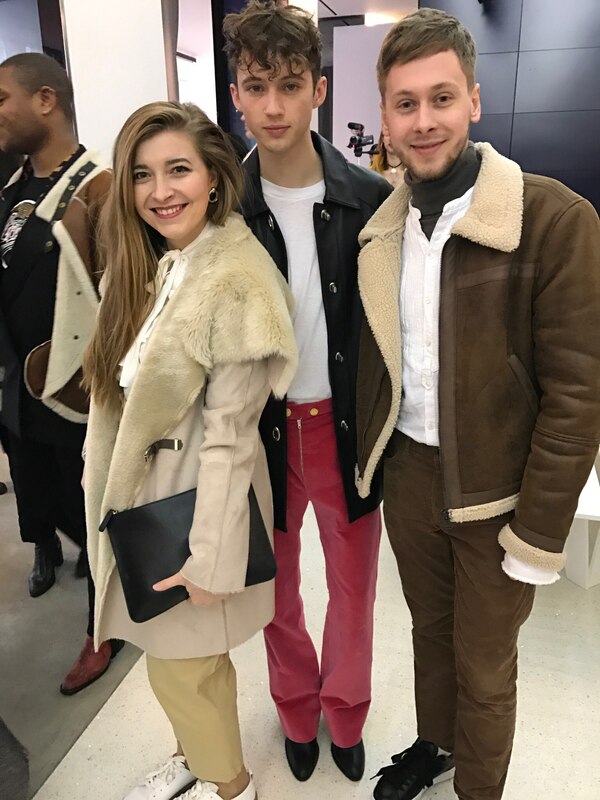 But scattered across the four days of New York Fashion Week Men’s Fall/Winter 2017, there were countless other considerations for our breakdown of the best collections; in the end, it was Billy Reid, Carlos Campos, N. Hoolywood and Todd Snyder that came out on top. Here are the best collections from New York Fashion Week Men’s Fall/Winter 2017. This season was all about balance for Billy Reid, the Florence, Alabama-based designer who sent out a line filled with washed corduroy, extra-soft cashmere and highly textural boiled wool. If you had the hankering for a wardrobe fit for wintertime cabining, then you wouldn't need to look any further; this was it. (And his softly constructed overcoats, dinner jackets and suits were only the beginning.) Hosted at the Beekman Hotel, with performance by actor Alex Sharp and singers Cedric Burnside and Karen Elson (plus others), this Southern-inspired shindig served up “lived-in luxury” that showed off Billy Reid's more wearable side. I first fell in love with Carlos Campos several years ago because, in my opinion, he was the absolute king of colorful coats; and, years later, not much has changed. While merging South American influences and his own Honduras origins may have inspired Campos to show a color palette of baby blues and soft pinks, his fall-winter collection certainly wasn't intended solely for the warmer climates. 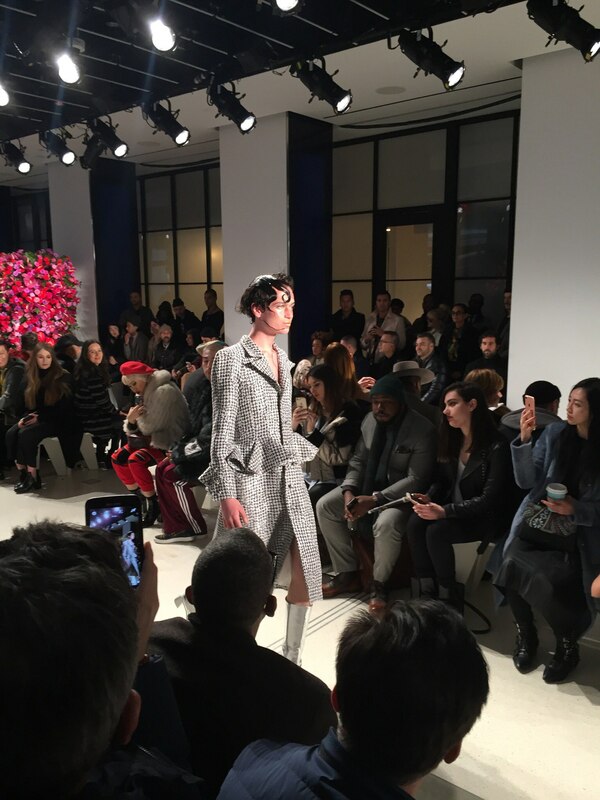 This was a quintessential summer-into-winter lineup filled with countless variations of Campos' love for outerwear—elongated topcoats, varsity jackets, safari jackets and flowy lab coats. Here is another collection that seemed to dazzle in its ability to maintain balance between trendy options and inspired (yet consistently wearable) wardrobe essentials. 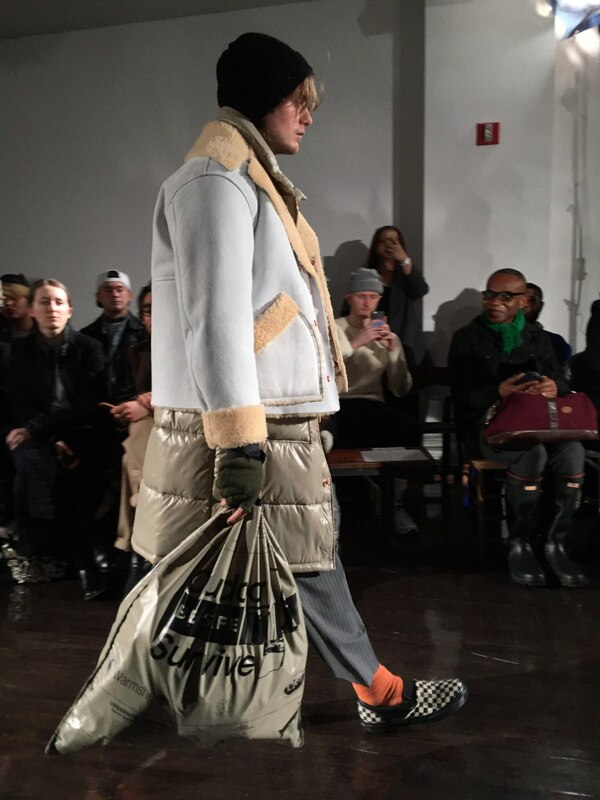 Inspired by the homeless youth of America, and their extreme modes of survival during the winter months, Japanese designer Daisuke Obana sent out a rather jarring range of off-kilter options onto his fall-winter runway. Complete with puffer jackets, sweaters (sometimes worn as scarves) and even a blanket or two, this unlikely (and somewhat controversial) inspiration fueled a collection that was hands-down one of this season's best examples of layering—and Obana's oversized coats and cropped trousers only perfected the look. Honestly, I hate to love it, but I really, really do. It's official: Todd Snyder knows exactly what we want—and he was certainly not afraid to flaunt it all over his fall-winter runway. Inspired by collegiate life before the Web, his latest collection exhibited the perfect balance between making runway moments and being retail ready—a commitment to his customers that resulted in countless variations of this season's top trends. With corduroy suits, inside-out military shearling, toggle coats, washed plaid shirts, retro sweaters and a Champion-collaborated burgundy varsity tracksuit, this season was vintage, it was varsity, it was military and prep. Seriously, there's never been a collection with this much game, and with only 37 looks. 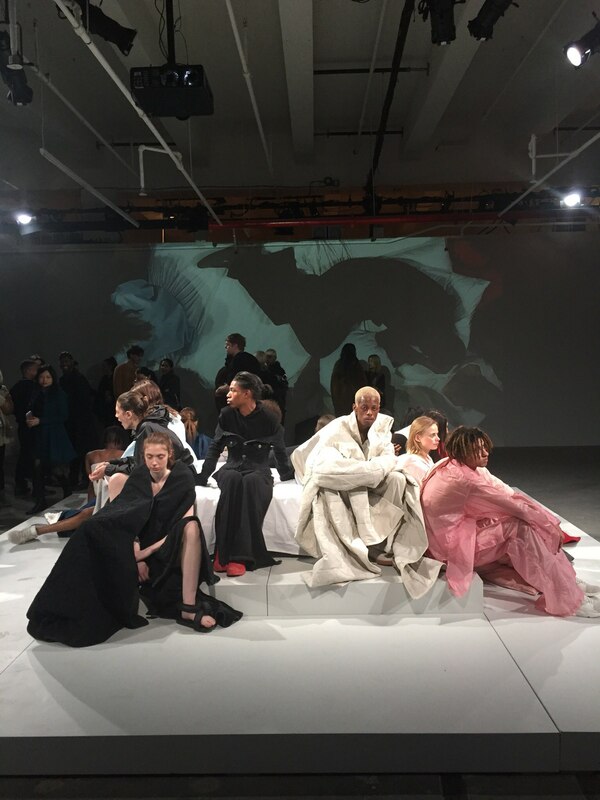 The collection everyone was waiting for, Raf Simons's first show in New York City revealed an emblazoned celebration of the town he now calls home—a move he recently made to take on the role of creative director at Calvin Klein. 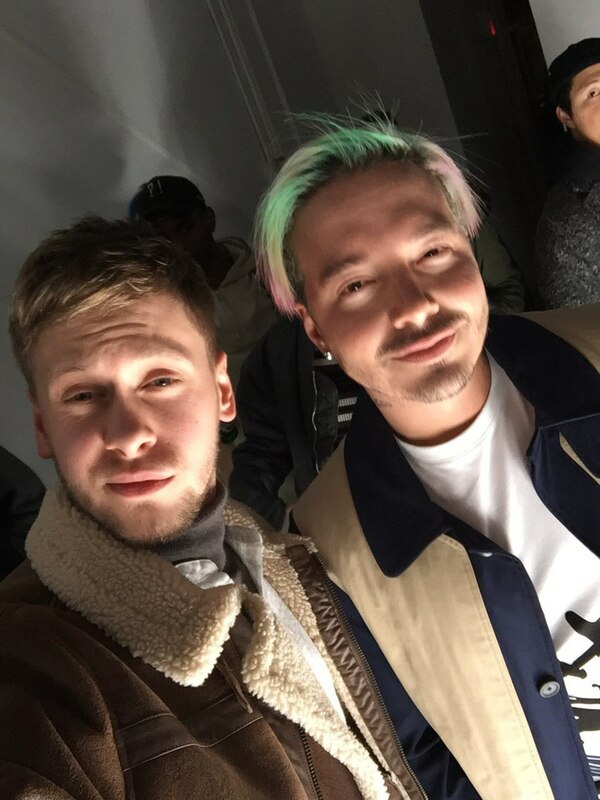 For Fall/Winter 2017, he fused sportswear pieces with fine tailoring (lux outerwear and oversize blazers included) for a line filled with cool, clean shapes and new beginnings, which he reveled in by enthusiastically plastering “I Love You” as recurring motifs. However, though there were several upon several of key looks this season, I can't help but think his workwear-inspired extra-long utility shirt and pant combo was the absolute perfect blend of Simons' refined eye for fabrications and his newfound love for American culture. Welcome to the States, Mr. Simons, we're glad to have you! Another stateside debut to make the list, the London-based label Represent by sibling designers Mike and George Heaton was a surprise addition to the seasonal roundup, with its upbeat athleticism and the perfect amount of grunge. Inspired by northern England in the Eighties and Nineties, this collection was not without its fair share of British blasts from the past: Velour tracksuits, cargo joggers, ripped (or bleached) denim and combat boots may have brought back our favorites from the 1990s, but the extra-cool laidback looks this season were definitely the Heaton brothers’ plaid coats and button-downs that completely captured the mood of an entire era. 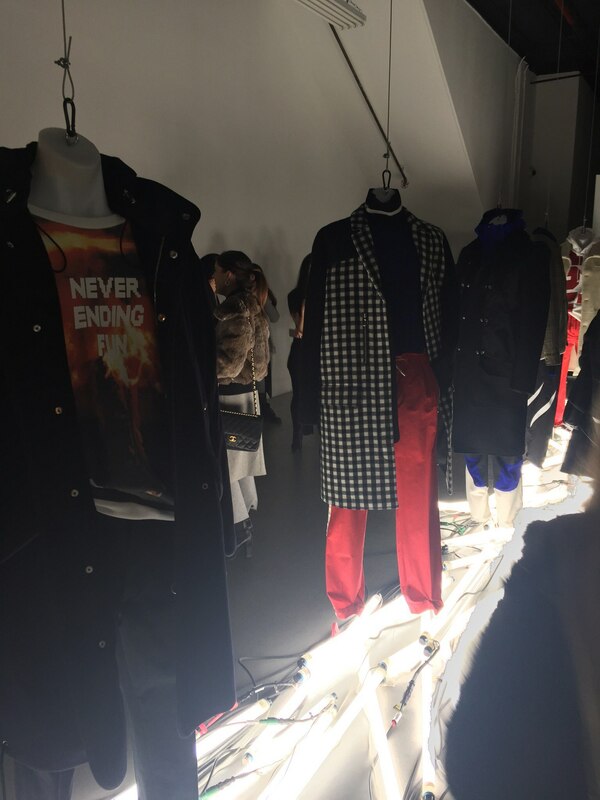 Tim Coppens portrayed a contemporary romance set in an apocalyptic, end-of-the-world scenario. A European boy visiting the States for the first time, a wild girl loyal to her white horse — there was nothing quintessentially romantic about this, except for cute birds printed or embroidered on the clothes, which added a sweet note. Staying away from a fairytale attitude, Coppens, the fair’s featured designer, opted for a realistic approach by elevating his ath-leisurewear to the urban stage. There were plenty of sportswear options for both men and women, including quilted bombers, tartan jackets with shearling collars and intarsia knitwear. These were all worked in a color palette that included classic neutrals combined with bright pops of red, yellow and electric blue.